Crostini is just another name for slices of bread that have been brushed with oil and baked until golden brown. 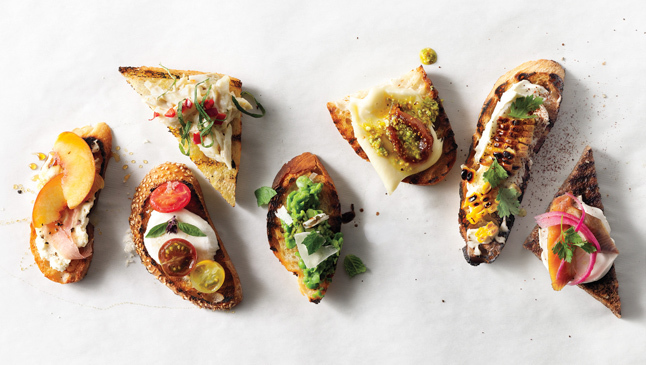 Crostini make for an endless variety of near-instant hors d’oeuvres. Just spoon on your pick of toppings and watch the crostini disappear! Crostini is the Italian word for “little toasts”. Crostini are believed to be a kind of Italian peasant food that originated in medieval times. The Italians, too poor to possess ceramic plates, preferred to eat their food by keeping it on the surface of slices of bread. The Italians, not a group to waste anything, often ate stale bread which had to be soaked in juices or wine in order to chew it properly. Bruschetta and crostini are both bread preparations used in antipasti – but what is the difference? The difference between bruschettas and crostini is the type of bread used. Bruschetta, from the Italian word “bruscare” meaning “to roast over coals”, is made by toasting whole, wide slices of a rustic Italian or sourdough type bread. Crostini are sliced from a smaller, round, finer-textured bread, more like a white bread baguette. In Italy you might find yourself offered an antipasto of four or five different crostini, no more than a couple of mouthfuls each, accompanied by some olives, but only one or two of the larger bruschetta would be plenty. Some do’s and don’t I picked up from the Bon Appetit Test Kitchen to ensure successful crostini. The bread you use should be high quality; look for fresh baguettes, boules and hearty country bread, preferably from a local bakery (as opposed to supermarket brands). Texture is very important–it shouldn’t be too dense. The bread needs to be thin enough to bite, but thick enough to support toppings -1/2-inch thick is just right. 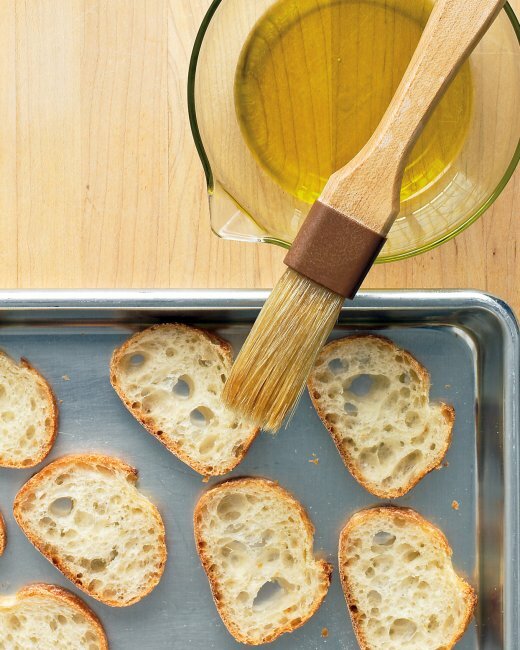 Brush olive oil on each piece before toasting it. Why? It makes the surface of the bread less dry. And it just tastes better. If the crostini are too hard, they will hurt your guests’ mouths and flake all over their clothes. The ideal texture: crispy on the outside and tender on the inside. To achieve it, bake, grill or broil bread over high heat, making sure to toast both sides. (If you cook on too low a heat, the bread will dehydrate and crumble upon first bite.) You’ll know it’s finished when the edges are browned but the center is lighter in color and still has a little spring to it. 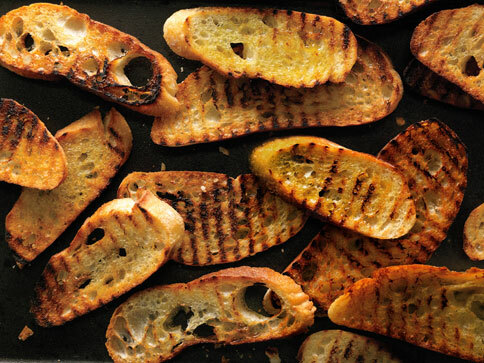 Flavor your crostini right after toasting. Things you can rub on the bread: a raw garlic clove, a tomato half – cut side-down or a whole lemon or orange–rind. The crispy bread will pick up the fruit’s essential oils. If you pile on the topping, it’s going to fall off when you bite into the crostini. You should be able to take bites without worrying about staining your shirt or dress. Wet topping = soggy bread. Use a slotted spoon when working with a wet topping (tomatoes, etc.) so that extra liquid is left behind. If using greens, dress them lightly. Using a serrated knife, cut one 8 ounce baguette diagonally into ½ inch slices. Makes about 20 slices. Preheat the oven to 350°F. Arrange the bread on 2 large baking sheets and brush each slice on both sides with olive oil. Bake for about 8-10 minutes, or until the edges of the bread are golden brown. Turn the slices over half way through the baking time. Let cool completely. Store at room temperature. Brush bread slices lightly on both sides with olive oil. Grill for 15 to 20 seconds on each side, until lightly brown, then remove with tongs and set aside. For broiling, position the rack so the slices are 2 inches from the flame and turn them over when the crostini start to brown at the edges. Here are some of my favorite combinations. They are easy to prepare and are always a big hit when I entertain. The recipes are based on 20 slices of crostini. Cut 10 medium peeled and deveined shrimp in half lengthwise. In a skillet saute 1 minced garlic clove and the shrimp in 1 tablespoon of olive oil until the shrimp turn pink. Spread each crostini with homemade or store bought basil pesto. Place one shrimp half on each crostini and sprinkle each with shredded Parmigiano-Reggiano cheese. Drain two 6 ounce jars of marinated artichoke hearts, reserving 2 tablespoons of the marinade. Finely chop the artichokes and place in a mixing bowl with the reserved marinade. Stir in ½ cup finely chopped sun dried tomatoes packed in oil and drained, 2 tablespoons pitted and chopped Kalamata olives and 2 tablespoons chopped Italian parsley. Mix well and spread mixture on the crostini slices and sprinkle the top with feta cheese. Rub crostini with a garlic clove or two as soon as they come out of the oven. Sprinkle each with a little balsamic vinegar. Grind fresh black pepper over each crostini. Spread on the crostini, top each with an orange segment and a small piece of arugula. In a food processor combine one 12 oz jar of roasted red peppers, drained, with a large pinch of cayenne pepper. Process until almost smooth. Spread pepper mixture on the crostini. Top with a piece of prosciutto and shredded mozzarella cheese. Preheat the oven to 350 degrees F. Bake crostini until the cheese melts. Serve warm. In a food processor coarsely process one drained 15 oz. can cannellini beans. Remove to a mixing bowl. Stir in ¼ cup shredded zucchini, 2 tablespoons chopped green onions, 2 tablespoons olive oil, 2 tablespoons red wine vinegar and ½ teaspoon coarse grained mustard. Spread on crostini slices. Top each with a half of a grape tomato and sprinkle with fresh thyme leaves. Thinly slice 12 oz cremini mushrooms. In a skillet heat 1 tablespoon olive oil and cook 3 minced garlic cloves for 1 minute. Add the mushrooms and cook for 8-10 minutes until the mushrooms are tender. Stir in 1/3 cup white wine. Simmer uncovered for 5 minutes or until wine evaporates. Season with salt and pepper. Spread crostini with a thin layer of mascarpone cheese. Top with mushrooms and sprinkle with chopped fresh chives. Halve and thinly slice 3 sweet onions. In a large skillet, heat 2 tablespoons butter. Add onions and cook, covered, on medium low for 15 minutes, stirring occasionally. Uncover and cook for 5 more minutes, or until the onions turn golden. Season with salt and pepper. Spoon onions on the crostini and sprinkle with crumbled gorgonzola cheese. Stir together 1 cup of whole milk ricotta cheese, 1 teaspoon shredded lemon peel and 1 tablespoon lemon juice. Spread mixture on crostini. Top each with thinly sliced fresh strawberries or figs. Drizzle with honey and top each with a mint leaf. What Are Your Favorite Toppings For Crostini? A minor distinction Heidi for sure. I thought the same thing, but why are there two different terms for a similr dish? So I found out. This one made me hungry! Great suggestions for crostinis. They are easy to make and everyone loves them. Love this post because I love bruschetta and crostini. I never realize the difference between them before. We are huge caprese fans and often have it without bread…is that a true caprese? I must go see your gnocchi post now. Thank you. I called this crostini, Caprese after the salad that originated in Capri. It has the same ingredients plus the bread. These are such great ideas. I love that first photo. So yummy. Thank you Amanda. I love to make crostini for an appetizer, guests are enjoy them so much.